6 - 7 large white camellia blooms (cut stems as long as possible) You could substitute Peonies. Camellias were first cultivated in China and Japan and the camellia became known to Europeans as the "Japanese Rose". The first camellias were brought to England in 1739 and then brought to America in 1797, when they were planted in New Jersey. By the 1840's they became very fashionable. Camellias are blooming right now in Southern California. In my garden I have the red camellias used in the Camellias and Berries arrangement (link above) and these large decorative white camellias with their long fringe like golden stamens. The white camellias with the clear marbles and the glass vase give this a clean, crisp look. You can buy a vase like this (click here) This arrangement is easy. Grab your garden sheers and let's begin. White camellia still on the bush. It's fabulous...very showy. You will use 1 large bag of clear, flat marbles. Carefully slide marbles into the bottom of the vase. Pour water into the vase. 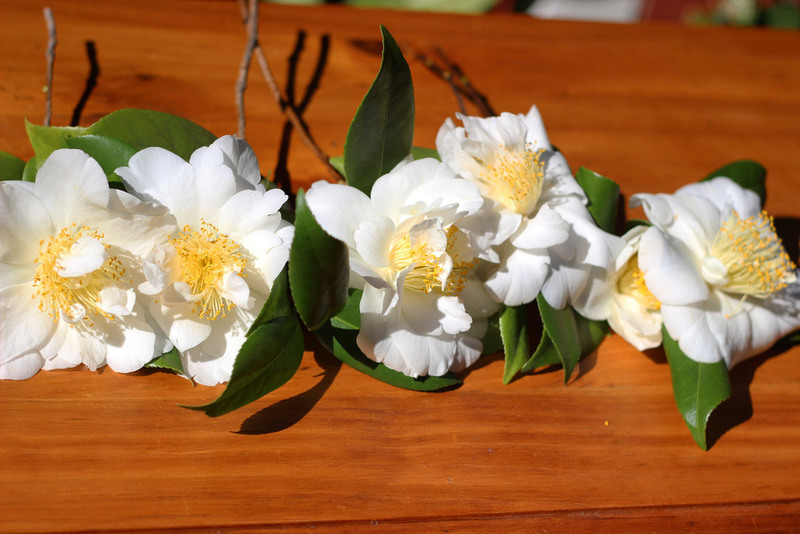 Cut 6 - 7 large white camellias, or 12 - 13 medium sized. Cut two stems with camellia leaves that are 14 inches long and place on both sides of the vase. Cut 5 camellias stems with leaves 12 inches long to fill in with. Pull any leaves off that will be below the water line. Push stems down straight. Tie bow in middle & you're done. These Japanese beauties are incredible. Enjoy!